It’s fall and the perfect time to plant carrots, coriander, dill, greens, radish. sugar snaps, and many other crops on the farm and in the home garden. Now for some tips on how to prepare the soil and plant these cool season crops. The proper natural bed preparation is done by adding the following to existing native soil - compost, lava sand, greensand, cornmeal and organic fertilizer. Then plant by broadcasting the seed and either lightly raking them into the soil or lightly topdressing with compost. Planting Dates: For spring, 3-4 weeks before last average frost. For fall, 8-10 weeks before first average frost. Plant seed in late winter for an early summer crop and in mid-summer for a fall-winter crop. In general, February 1 - March 20 and August 1 - August 31. Planting Method: Seed should be broadcast on top of the soil and then gently watered in. Seed can be planted in single rows, double rows, or broadcast. Water often with a light mist until seedlings emerge, but don’t water too heavy or too often. 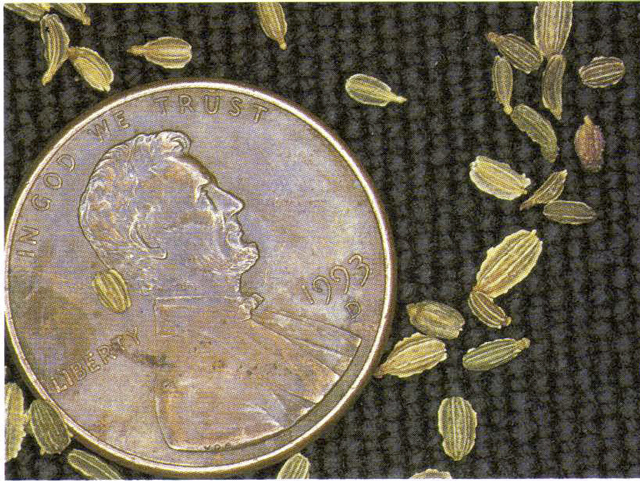 Seed Emergence: Seed germinates in 6-20 days at 68-86°, but will germinate as low as 40°. Harvest Time: Any time the roots are large enough to eat. Maturity 70-100 days. 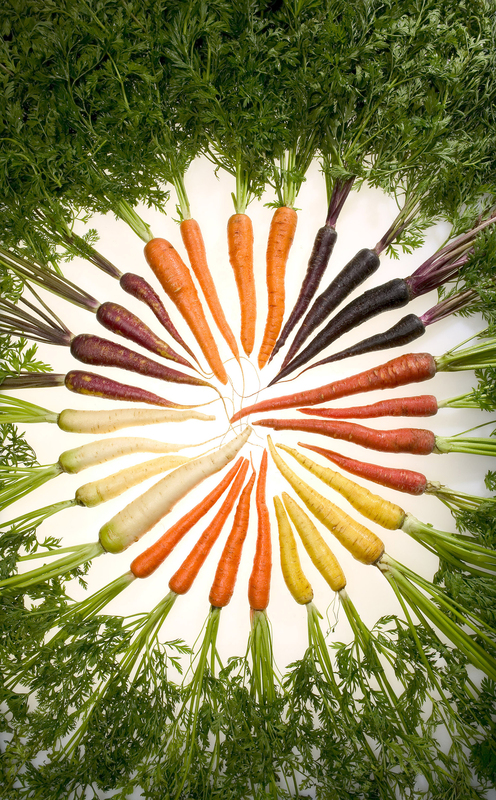 Carrots come in many colors. Final Spacing: 3-4 seeds per inch, then ½ inch apart, final spacing of 2-4 inches on center. Wide rows are best. Thin the carrot seedlings to 12 plants per square foot. Eat the small ones that are removed. Growth Habits: Ferny top growth and large, showy white flowers. 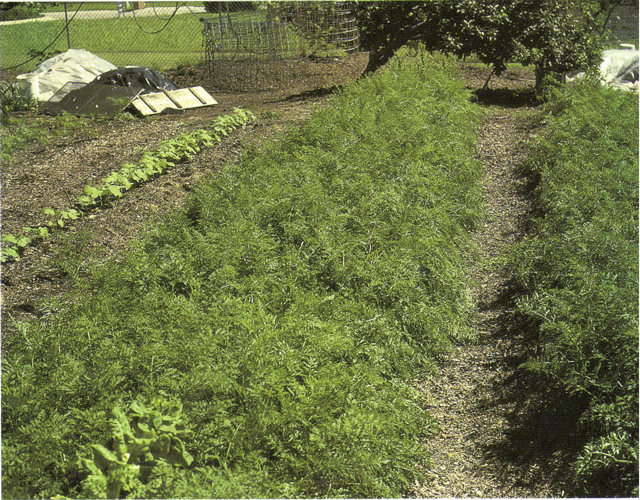 Culture: Carrots must have soft, healthy soil and moderate fertility. 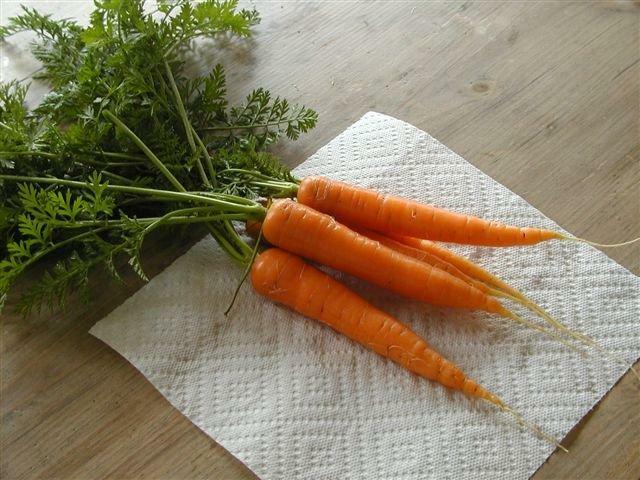 If the roots hit rock or hard spots in the soil, the carrots will be deformed. Too much fertilizer will encourage top growth instead of roots. Keep plants mulched as they grow. They like cool weather and will grow all winter in these conditions. Mulch the top of roots to prevent “greening.” Maintain even soil moisture level as carrots mature. Root length is made the 1st weeks, then enlargement happens. Troubles and Solutions: Insect pests include grubworms, wire worms, cutworms, snails, slugs, and pillbugs. Other pests include nematodes, bacterial diseases, and rabbits. Armadillos can also be a problem. Build soil health and spray with Garrett Juice as a foliar feed and citrus-based mixes for serious pest infestations. Use hot pepper repellents for animal pests. Cracking can be avoided by not overpowering and over fertilizing. Harvest and Storage: Dig the roots any time they are of edible size. Eat fresh or store in the refrigerator. They can also be stored in the winter by leaving them in the ground. Carrots increase in sweetness and food value in cold weather. They can also be stored in the refrigerator at 32-40° for about 10 weeks or more. Notes: Carrots are a great source of many vitamins and minerals. Their roots develop in the 4-6 week period after their emergence. Lack of flavor can be caused by moisture stress, high temperature during maturity, or lack of trace minerals in the soil.